Your craving to flaunt new hairstyles is a never-ending one, so here's something to meet your need. Try this French knot hairstyle! This is an easy way to dress up your hair into an artistic hairstyle. Comb your hair thoroughly so that they become smoother and easier to manage. 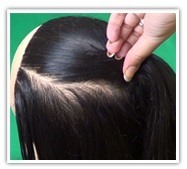 Neatly separate a section of hair from the central region of the top of your head. Hold it using side pins as shown in the video. Again, comb your hair entirely, including the separately held section and hold them together as you do while making a pony. Hold the base of the pony and twist the pony so that it covers your left hand fingers. Now remove your left hand from the center of the twisted pony keeping it tight and fix it at the top using bobby pins on all its sides so that it forms a bun. Similarly fix the tail. Settle the extra hair which may come out of the bun. 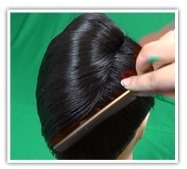 Tighten the bun as much as possible. Use a hair spray for a shiny look. 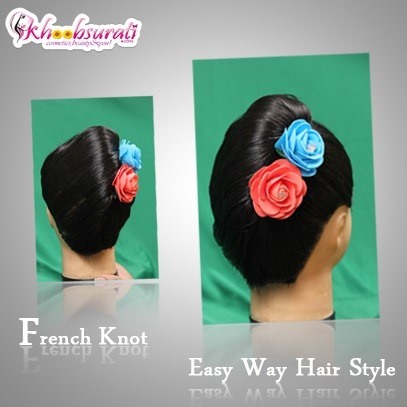 Add flowers or any other catchy hair accessory to enhance your look. Surely you have the urge for a better look. This hairstyling trick allows you to sport the simplest hairstyles with a spark of style. Give it a go and daze everyone with a new appealing hairstyle!!! The final look is gorgeous.